“How can I help employees perform tasks assigned to them efficiently, effectively, and safely?” – A question that’s on every manager’s mind. Procedural-based training is designed to help train employees on the skills needed to perform tasks assigned to them. All the above challenges can be handled in the process of converting procedural training from ILT to eLearning. According to Ruth Colvin Clark, a procedure is a series of clearly defined steps that result in the achievement of a job task (Developing Technical Training, 2nd Edition). According to research from Advanced Distributed Learning (ADL), classroom training as well as eLearning are equally effective in procedural training. In classroom training programs, it is the instructors who play a huge role as they bring with them their subject matter knowledge and work experience. But in eLearning, the instructor is missing. How can you successfully convert procedural training from ILT to eLearning? Here are 5 challenges to consider when you plan to convert procedural training from ILT to eLearning. In an ILT, the instructor is in charge of the learning process and ensures that each and every step in the procedure is explained clearly to learners. Learners are also given an opportunity to ask questions and clarify their procedural knowledge. Consider a software training program. The instructor in an ILT or virtual ILT can share his/her screen to demonstrate the steps to perform a task, e.g. : generating a purchase order (PO) using the ERP software. The instructor can adjust the pace of training and if learners are not clear with a particular step, the instructor can walk them through the step again. But that’s not the case when you convert from ILT to eLearning. Here you do not have an instructor guiding learners through the procedural training. E-learning is self-instructional, and learners need to be given detailed information on each step that needs to be followed. While your training manual can simply state, Step 1: Complete this! 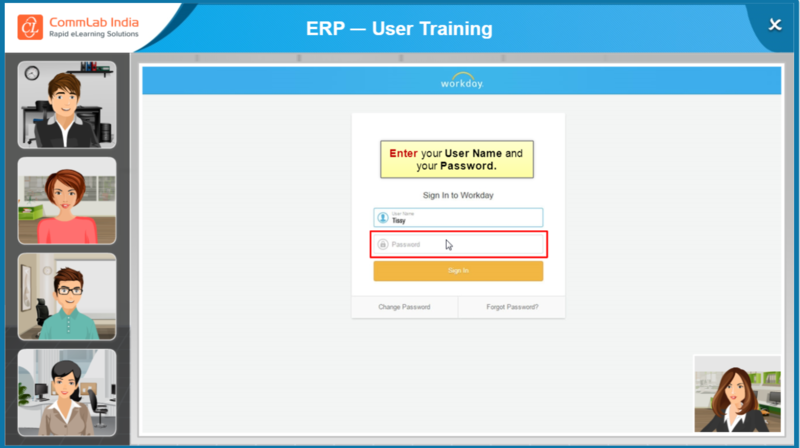 Or Step 2: Complete this!, you cannot do this in an online training program. Explain to learners why they are performing a particular step and how it’s going to help them achieve the learning objectives of the training program. Though sustaining learners’ attention can be a challenge both in the classroom as well as online, in the classroom, the instructor takes care of delivering structured training that engages learners. What technique can you try when you convert procedural training from ILT to eLearning? Consider an example where you’ve to train employees working in a research laboratory on the safety procedures to be followed while handling hazardous chemicals. While in the classroom, the instructor can talk about real-life incidents to help learners understand the implications of not paying attention to the training, how do you translate the same to an eLearning course? Find out what can go wrong if a particular procedure is not followed, its impact on the employees or the organization, and include this information in the eLearning course. Use scenarios and illustrations wherever possible to depict the hazards that can result from not following the safety procedure. When learners are told why they need to perform a procedure correctly and understand the risks associated with not doing it the right way, they are more receptive to the training. Another challenge you might face when you switch procedural training from ILT to eLearning is accommodating learners with different experience levels. Consider an online training on an e-procurement software. New employees need to be trained on how to fill the requisition form. But this may not be necessary for someone who knows how to fill in the requisition form because they have already done this in a manual system. They would be more interested in the steps to submit the form online. In classroom training, you have an option to schedule different sessions by segregating participants based on their prior knowledge of the software. How can you deal with this challenge in an eLearning course? The eLearning course can contain information that’s required for beginners but experienced learners can skip the detailed steps on filling in the requisition form. Likewise ‘nice-to-know’ information in the Resources section can help experienced learners who would like to know more about the e-procurement software. 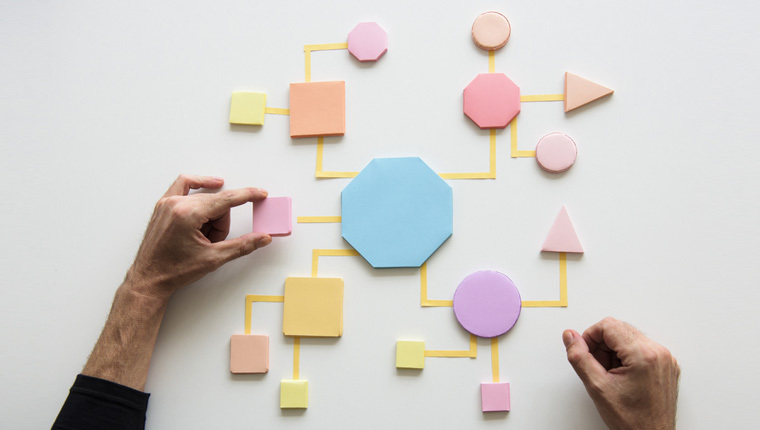 When you make the switch from ILT to eLearning, pay attention to the strategies you’re going to use to teach different types of procedures. Guided simulation is a common method to teach computer-related procedures. Each procedure is broken down into tasks that can be taught through short demos. You can have a simulation that shows learners how to perform a task, followed by a practice session which lets learners practice their skills. Here’s a screenshot from an eLearning simulation to train learners on using an HRIS application. Non-computer-related procedural training can leverage the strength of visuals to demonstrate the procedure. For example, for an eLearning on safe lifting practices, visuals are effective in conveying the unsafe practices and also displaying the steps for safe lifting. 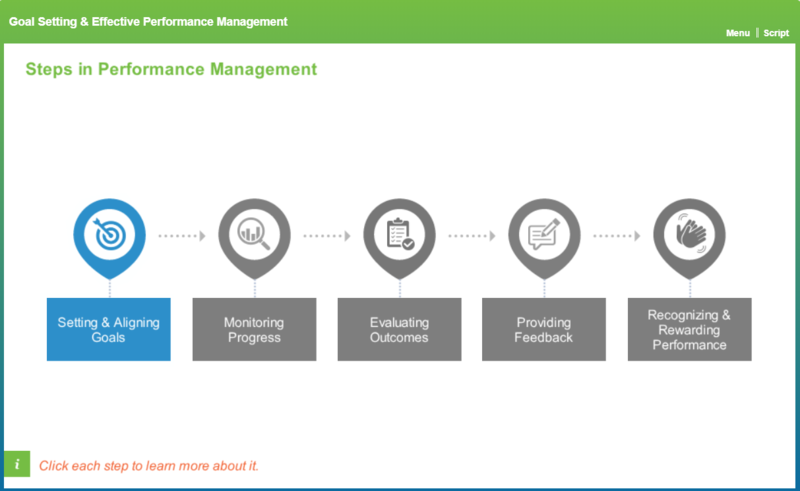 Shared below is another example of a non-computer-related procedure we are all familiar with, performance management. Illustrations, animations, and videos are all effective formats to teach non-computer related procedures. Instructional feedback is when you let learners know whether their answers were correct or incorrect. It can also include verbal hints or a corrective statement for incorrect answers. In a simulation for software training where you want learners to try a particular procedure, let learners know whether their attempt was correct or incorrect on the first try. Ask learners to try again and in case of an incorrect attempt the second time, provide corrective feedback. You can decide the number of tries that a learner is allowed. In naturalistic feedback, the learner is able to experience the consequences of an incorrect action by simulating real-world consequences. For example, in a training on safe lifting practices, every time a learner chooses an unsafe practice for lifting heavy objects, immediate feedback is given. This feedback can also be in the form of real world scenarios that depict the consequence of following an unsafe lifting practice. E-learning for training employees on procedures is capable of delivering a learner-centric, active learning experience. There is no doubt that when you convert procedural training from ILT to eLearning, you will save time and money, and improve the reach of your training program. Making a switch from ILT to eLearning for procedural training entails the SMEs to work in tandem with an eLearning developer to capture the essence of the classroom training in eLearning. Are there any other challenges you can think of when converting procedural training from ILT to eLearning? If yes, please share through the Comments section.